For any non-vegetarians reading this, you may be wondering how in the world we replace the pancetta in this beloved Italian delicacy. Have a seat, pour another glass of Prosecco, and allow us to explain everything. 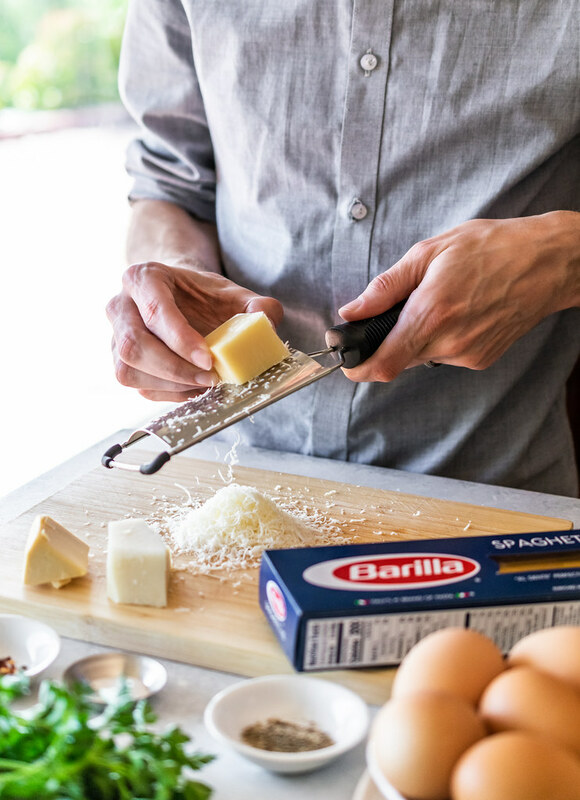 We do a few things differently that set our Carbonara apart. 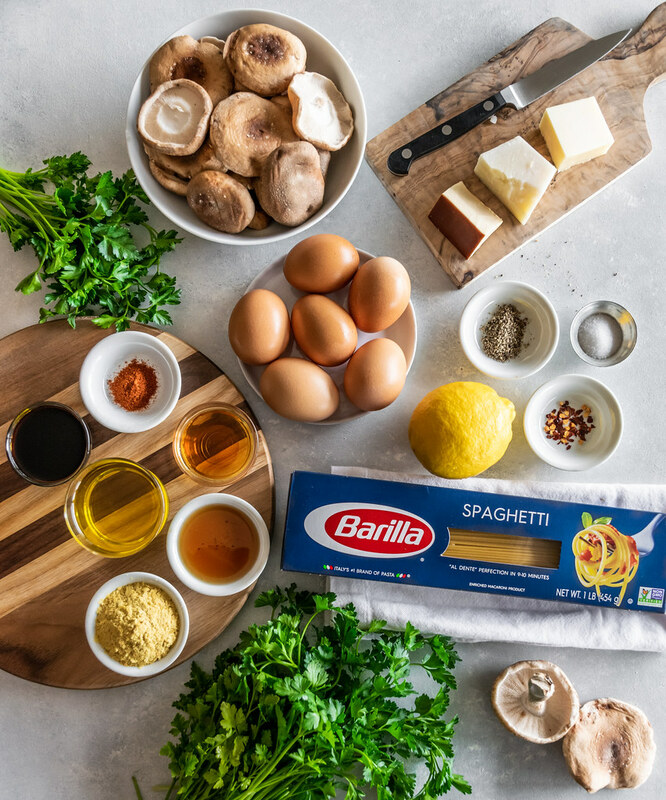 First, the foundation of any Carbonara dish is the pasta, so we used Barilla® Spaghetti, the traditional pasta cut typically used in this beloved dish. In addition to the classic parmesan and pecorino cheeses, we also add a bit of smoked gouda, which provides a bacon-y flavor and a smooth, creamy texture. 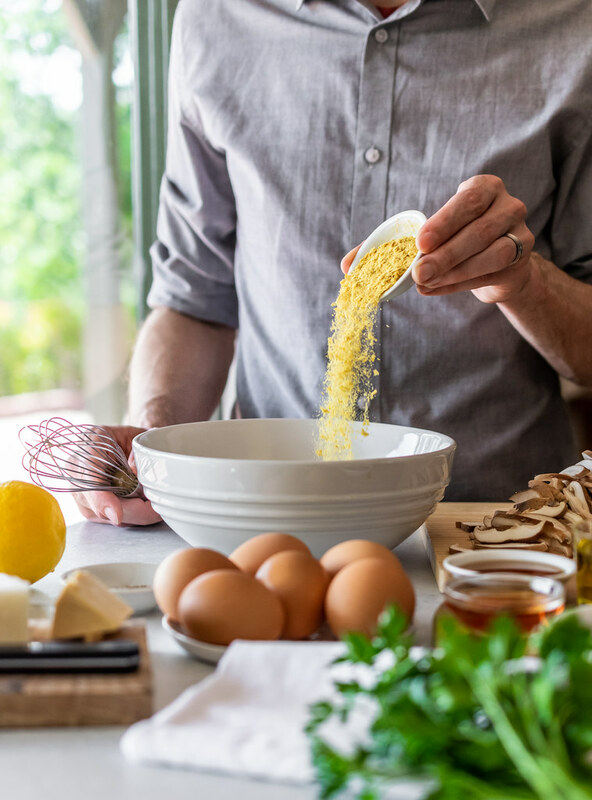 Between that and our secret weapon—which we are about to reveal—please say hello to your new favorite Carbonara recipe. What makes our Carbonara so special? 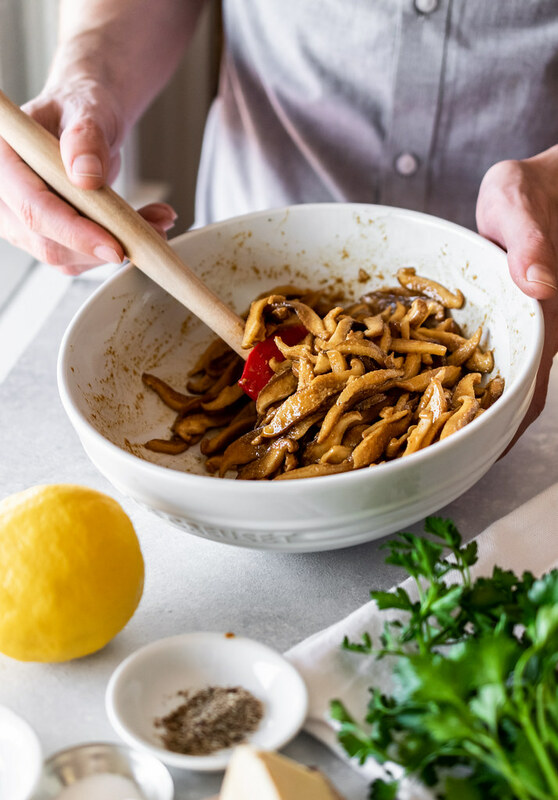 Besides a little lemon zest and a pinch of red pepper flakes, we use the Shiitake Bacon recipe from our new cookbook which makes this meatless version just as tasty—pasta-bly even better than the original. This calls for more Prosecco! 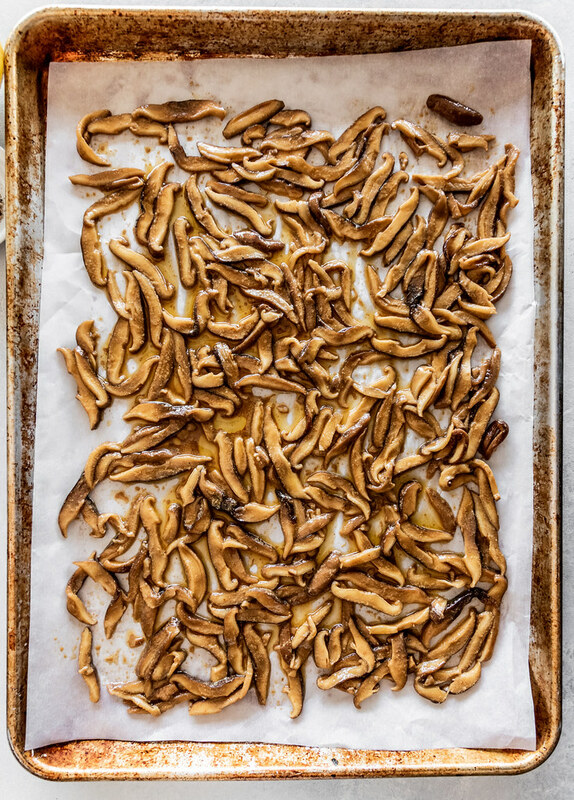 Thinly sliced shiitake mushrooms are marinated in a magical mixture of soy sauce, liquid smoke, nutritional yeast, toasted sesame oil, and smoked paprika, then baked until crispy. “While no one would be fooled that this is bacon,” we describe in our new book, “the crunchy texture and savory flavor are so tempting, you may just find yourself hovering over the pan and snacking on it by the handful…” And while it makes a fabulous BLT and a perfectly crunchy salad topping, it also transforms this traditionally meat-filled meal into a scrumptious vegetarian alternative. Thankfully, this gourmet dinner is easy to prepare. 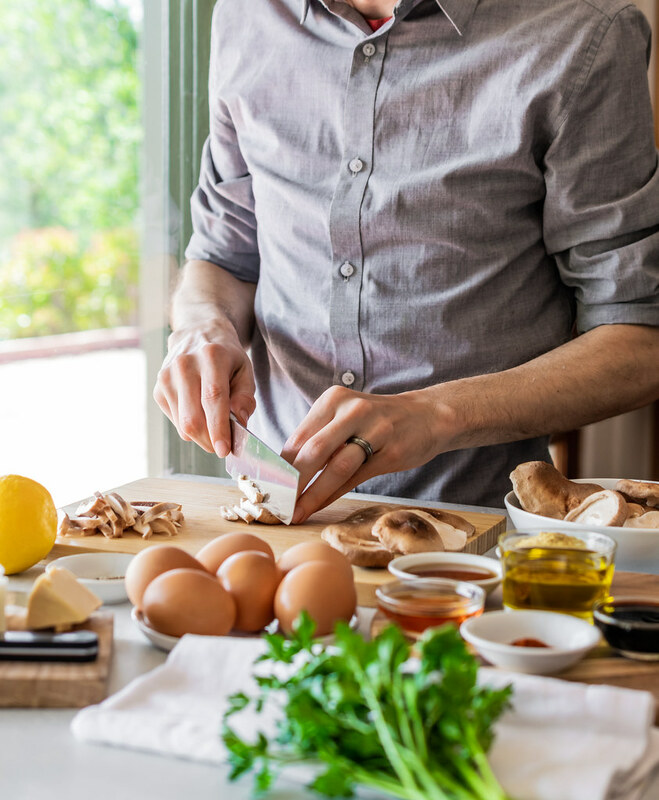 First, you make the shiitake bacon, which can be prepared ahead of time—just make sure you don’t devour it all. 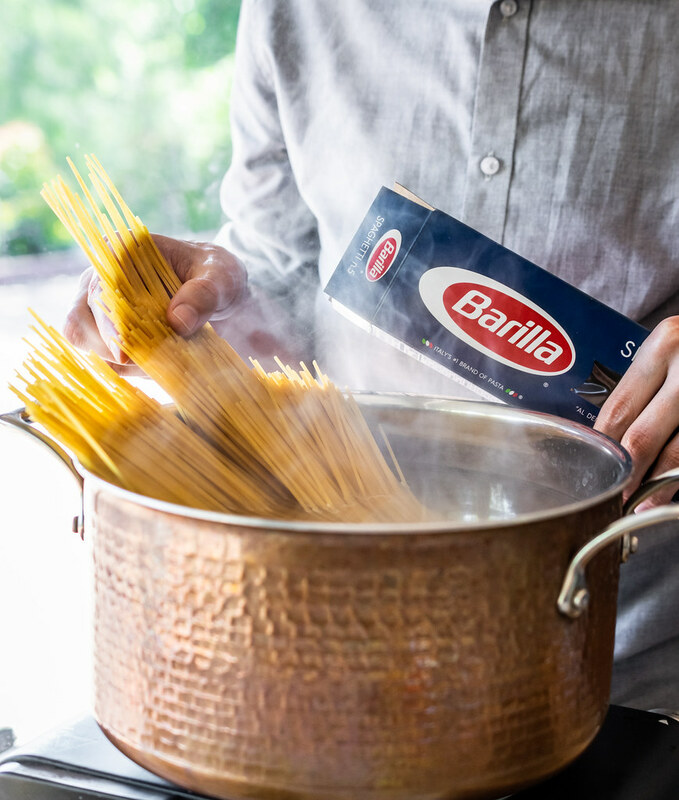 Then, while your Barilla pasta is cooking, simply mix the sauce ingredients in one bowl. When the spaghetti is al dente, you drain the water, pour over the golden mixture, add the shiitake bacon, and that’s it. 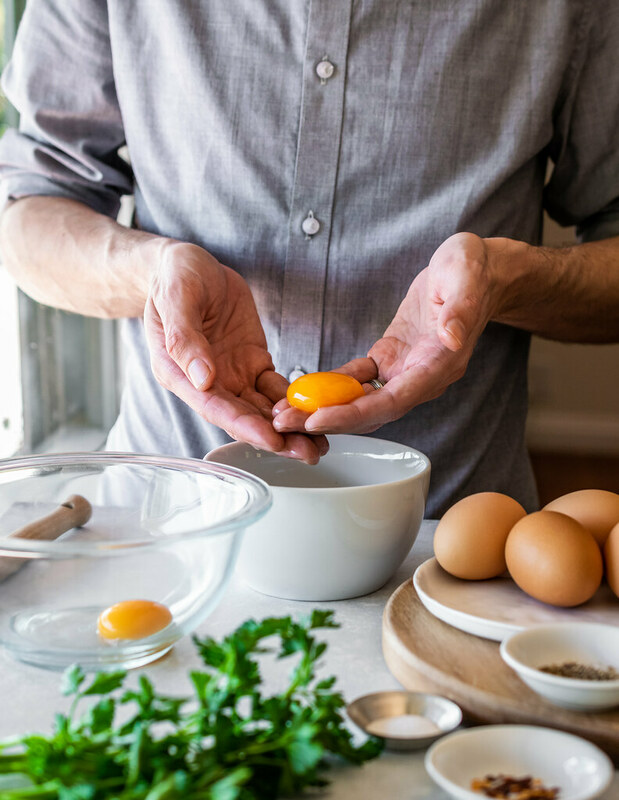 Congratulations—you’ve officially turned your home into a five-star dining experience. 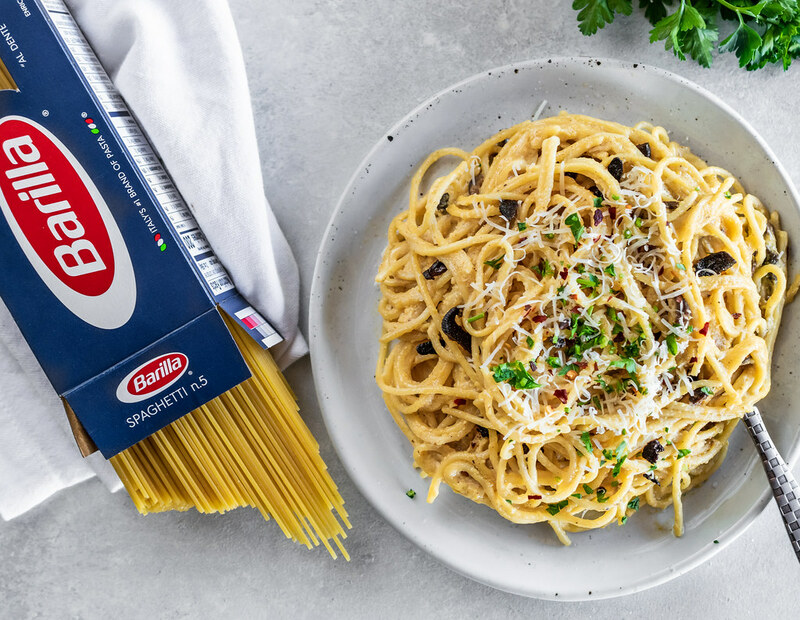 This year, Barilla is inviting everyone to join the celebration by taking the #CarbonaraChallenge. 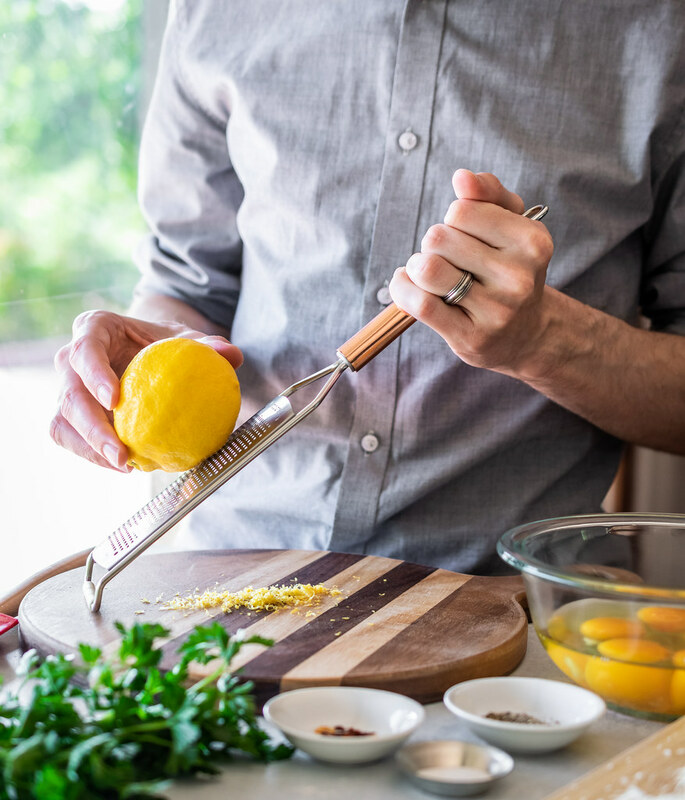 Simply make your favorite Carbonara recipe (um hello, this one! ), post the dish on social media, and tell your friends to take the challenge too. For more #CarbonaraChallenge inspiration, visit barilla.com. Buon Appetito! Fill a large, deep pot with 4 to 5 quarts of water, adding 1 teaspoon of salt per quart of water. Set over high heat, cover, and bring to a boil. 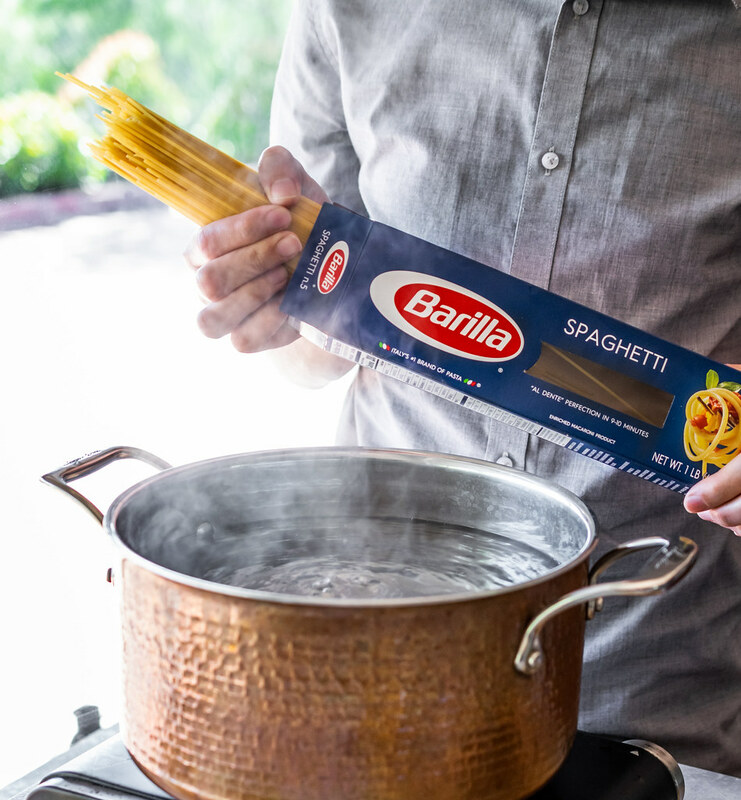 When boiling, add the Barilla Spaghetti, and cook according to package directions until al dente, about 9 minutes. Do not overcook. 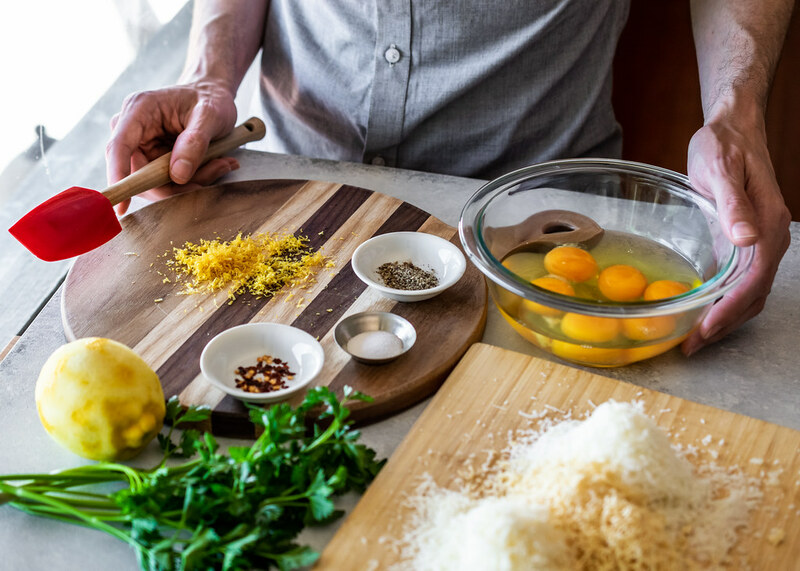 While the pasta is cooking, make the sauce: in a medium bowl, combine the eggs, egg yolks, parmesan, pecorino, smoked gouda, salt, pepper, red pepper flakes, and lemon zest. Stir until blended and smooth, then set aside. When the pasta is al dente, reserve 2 cups of pasta cooking water, then drain the spaghetti into a strainer. 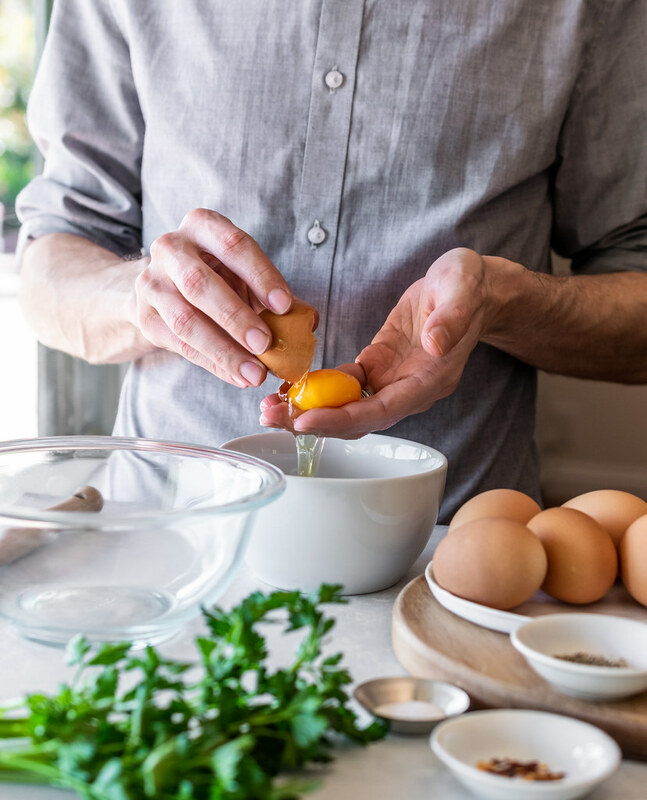 Return the pasta to the pot, but do not place the pot back on the hot stove as the excess heat will cause the eggs to curdle—instead, place it on a cool stovetop, trivet, or heatproof counter. 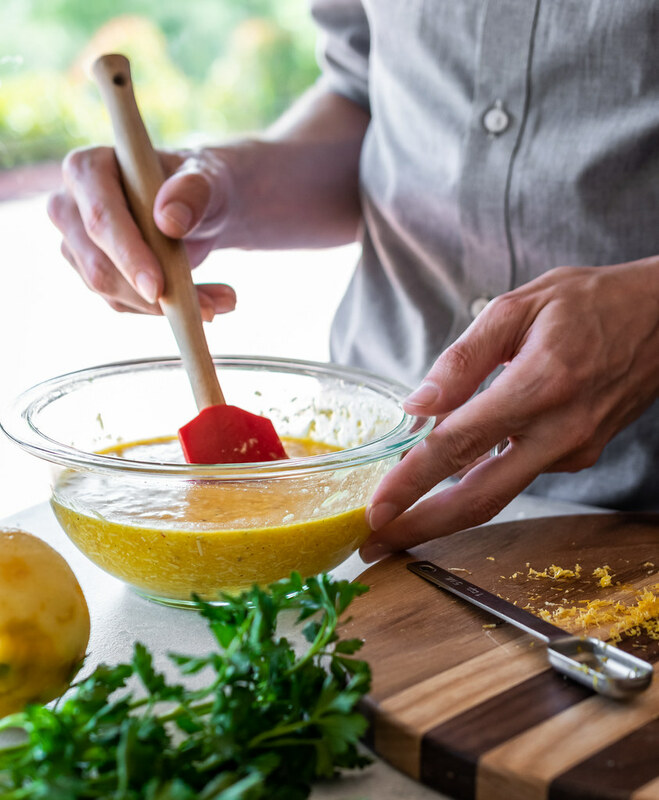 Quickly add about 3/4 cup of pasta water and the egg mixture, and stir vigorously to coat the spaghetti. Add the chopped shiitake bacon and continue to stir, adding more pasta water as needed to make a creamy sauce. 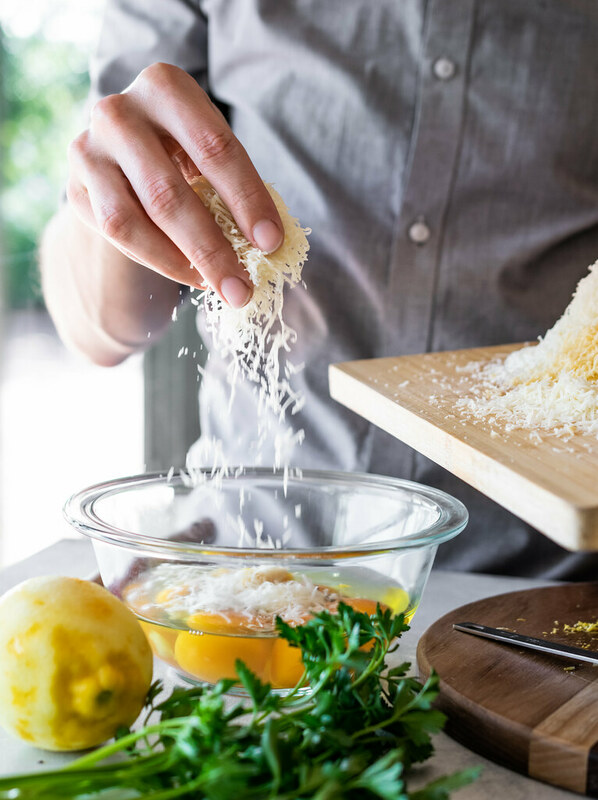 If the pasta is sticky or dry, add more pasta water and stir until smooth. 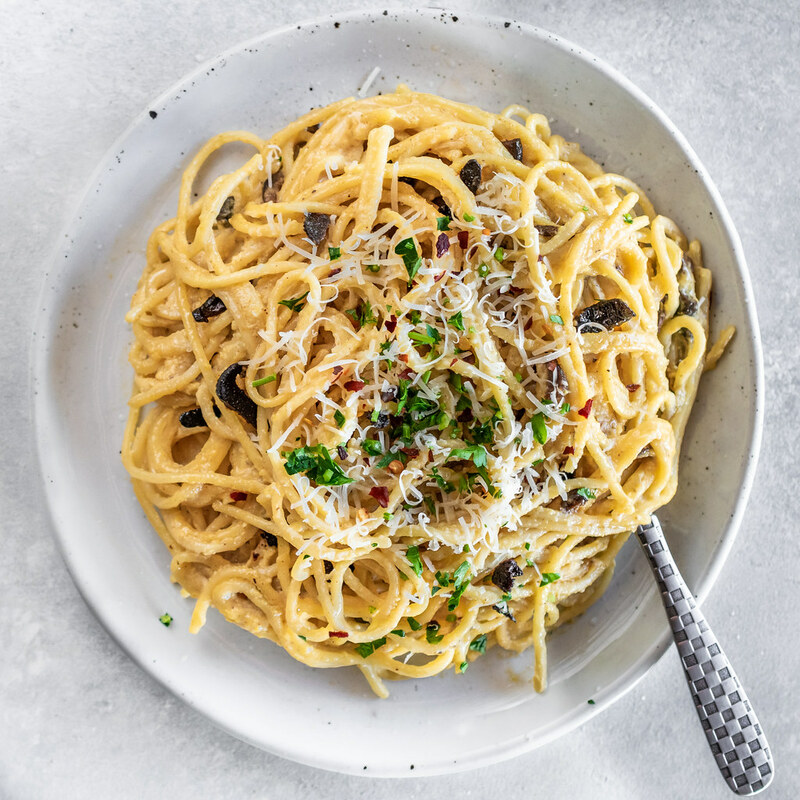 Serve immediately while hot, topped with parmesan, chopped parsley, and additional shiitake bacon, if desired. Enjoy! 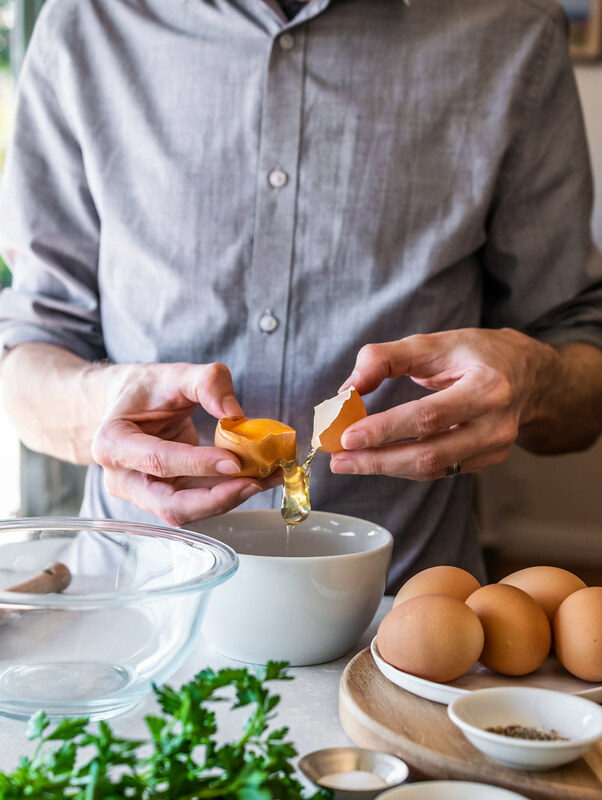 Preheat the oven to 350°F/177°C, and line a rimmed baking sheet with parchment or a silicone baking mat. 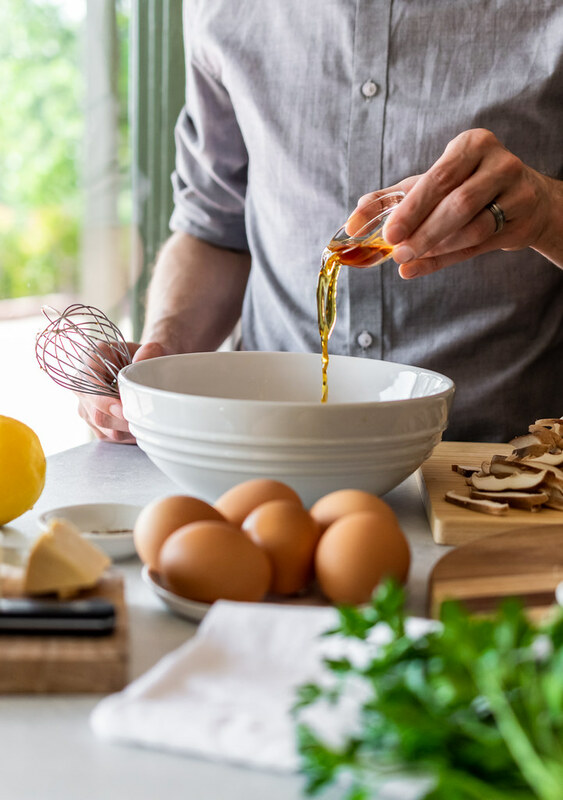 In a large mixing bowl, combine the liquid smoke, tamari, nutritional yeast flakes, olive oil, sesame oil, and paprika, and whisk to blend. 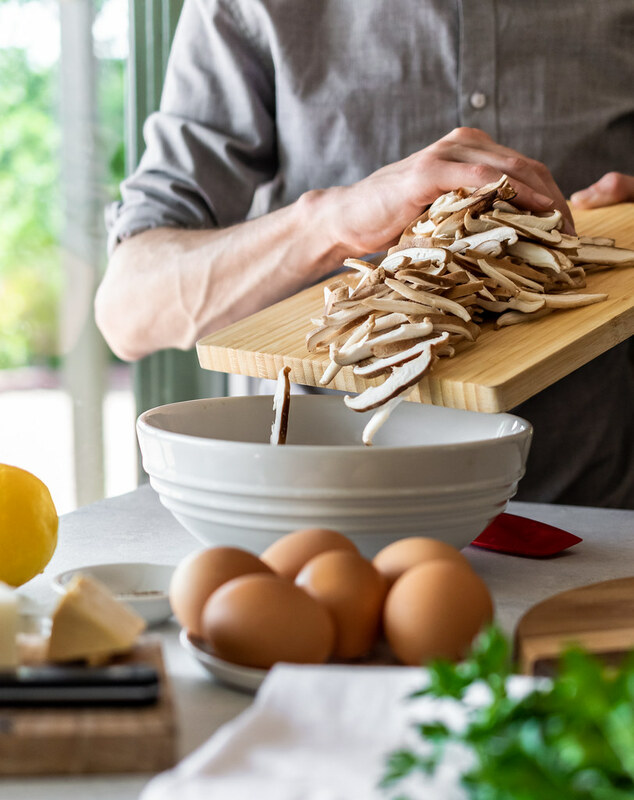 Add the sliced shiitakes and toss gently with a rubber spatula to coat the mushrooms without breaking them apart too much. 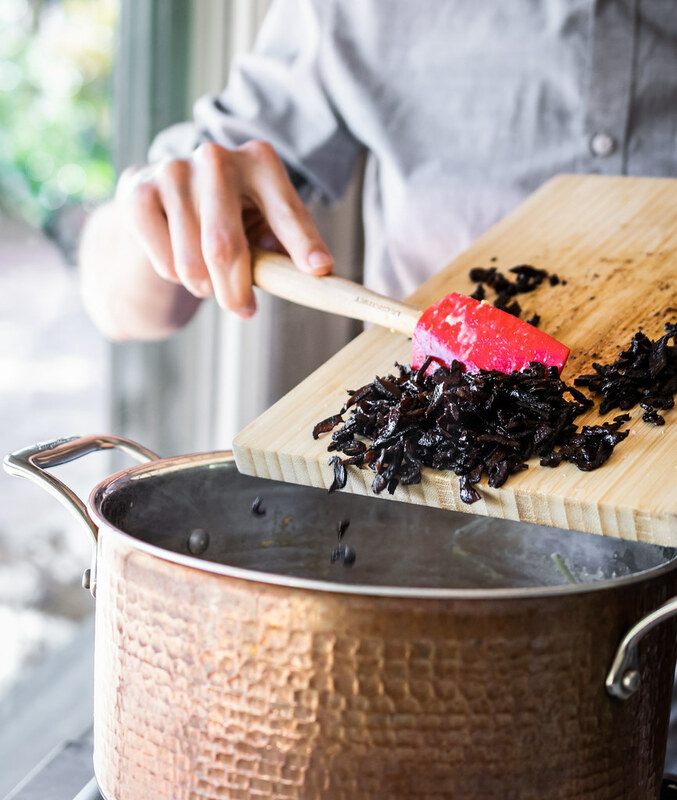 Cover the bowl with plastic wrap and let them marinate for 20 to 60 minutes at room temperature. Spread the mushrooms and their sauce on the prepared baking sheet, and arrange into a single layer. Bake until crispy, 40 to 55 minutes, tossing occasionally. 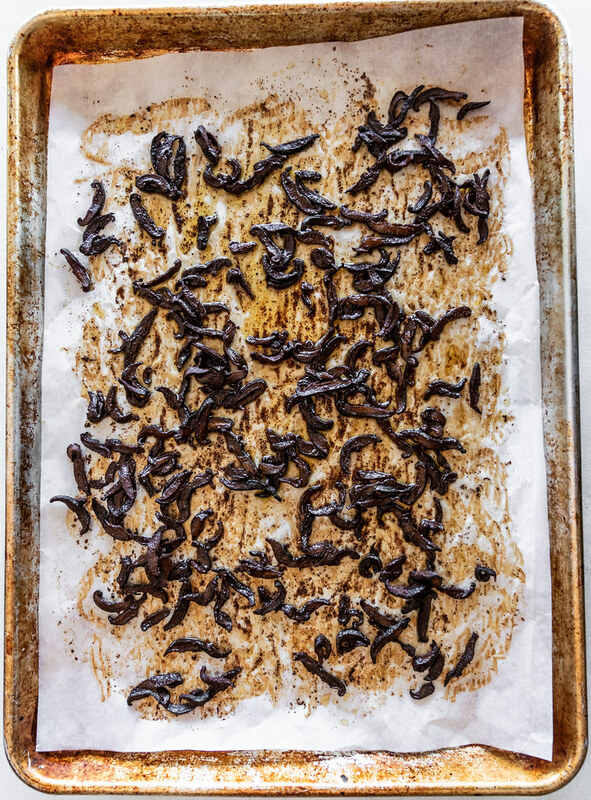 When testing for doneness, keep in mind that the mushrooms will become crispier as they cool. 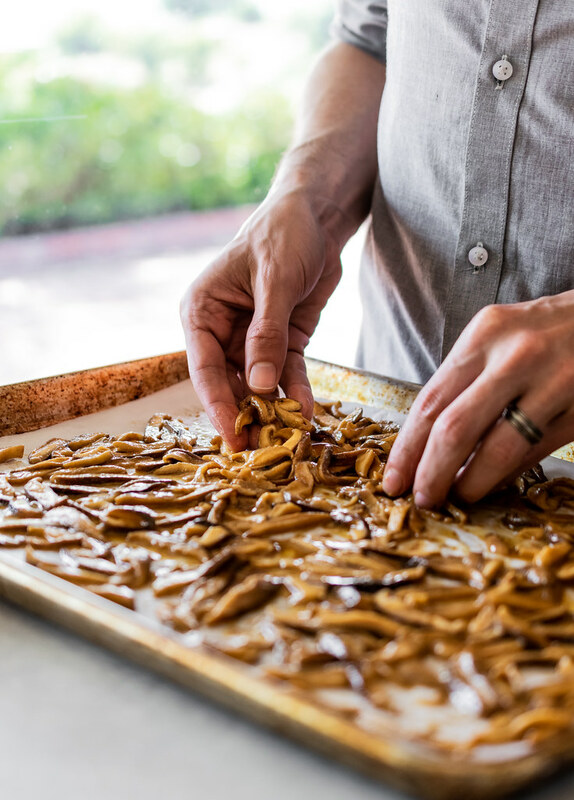 — The shiitake bacon can be cooked up to three days ahead of time, cooled completely, then stored in an airtight container in the refrigerator.